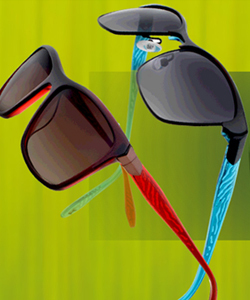 The Koali Eyewear collection is inspired by the wonders of nature – the flora and fauna of the living world. This inspiration is expressed through temple decorations, endtip treatment and the interplay between materials and colors. This distinctly feminine collection of optical and sunglasses replicates the fluid lines and unique color combinations found in nature. The creative design process creates a line of eyewear that exudes elegance and luminosity with vibrant and unusual color combinations. Koali Eyewear is discreet yet exclusive with each line taking it’s inspiration from a different aspect of the beautiful balance in nature, whether it is in color, contrast or material. In addition to the beauty of the design, Koali eyewear is made from high quality materials with innovative features that create a strong and durable eyewear.